What is P﻿﻿aper Money and ﻿﻿Paper Trading? ​Step 1: Visit the Thinkorswim website and simply click "register here for paperMoney"
What is Paper Trading & Paper Money? ​To effectively make use of paper trading practices, we’re going to make use of paper money or “fake” money, if you will. Paper trading is basically the notion of trading with fake or pretend money to see what outcome your investment decisions might lead to. Paper trading is very useful for a number of reasons. When you plan to invest any given sum of money, you’d want to see the effect it has before you actually take the plunge with real money. The benefit lies in the practice of making real trades without real money, because frankly speaking, newbie stock trading can be a scary thing. Trust me, I’ve been there and don’t want you to be in the same position. ​Before proceeding any further, I just want to quickly share with you how things went from bad to worse for me, simply because I failed to take paper trading seriously. I started out back in 2011. I was a young and hungry investor at the time, completely new to stock investments. I had witnessed a lot of my friends and acquaintances taking huge gambles and making thousands almost overnight. I wanted in – I wanted a taste of that money. However, unbeknownst to me at the time was my sheer lack of knowledge and experience. I started making blind trades without any real strategy. I was just hungry for seeing investments returns and things, unfortunately, took a turn for the worse; I made the fatal mistake of trading with actual money, rather than practicing with paper stock trading as I should have. Before I knew it, I was buying and selling stocks with reckless intent. Eventually, I lost pretty much every cent I had and that was a harrowing experience which I don’t have the words to describe. I decided it was the stock market’s fault and not the reckless decision-making. Finally, I stopped playing the blame game and realized that it wasn’t the stock market that was stacked against me. It was me. “I” was the problem. After all, I didn’t take the time to learn and practice investments through paper trading – I just wanted to be a part of the “get rich quick” business like my friends. I had very little know-how on how the stock market actually worked. Well, I finally mustered up the courage to acknowledge my failures and started thinking more along the lines of an investor rather than a gambler. I perfected my investment strategies and made my money work for me. ​I just want you to know that I’m somewhat proud of the money that I’ve made as a result of real investment education and not gambling. Through paper trading, you will never have to risk losing hard-earned cash just to test out various stock trading strategies. You get to practice as much as you want without taking any real-world risks whatsoever – I just wanted to reiterate that a bit more in case you missed it! It’s very easy to create a paper trading account, starting a $10,000 balance, $200,000 or even $10 million. I’m going to show you exactly how to do that. ​Only the smartest investors incorporate certain strategies to make sure no stone is left unturned, before venturing out into the real investment world. If you’re looking to stay ahead of the stock market curve using highly innovative tools to arm yourself with the right investment strategies, there really is no better way to do that than Thinkorswim PaperMoney. The art of smart investments lies within educating yourself and while you’re at it, why not do it in a fun and interactive way? Thinkorswim ® is an advanced virtual trading platform by TD Ameritrade that offers a holistic trading experience to keep you on top of your virtual investments. I’ve personally been using Thinkorswim ® for years to stay well ahead of the curve and tell me tell you this isn’t just your everyday run-of-the-mill trading platform. You’re getting innovative technology and cutting-edge features right at your fingertips. You can empower yourself to analyze, devise strategies and trade like never before. ​If you've already opened a real trading account from TD Ameritrade, you don't need to register a demo trading account. You can use your existing account to login to the Thinkorswim® trading platform. If you haven't created an account yet, simply click "No" to fill out a few on-screen details before choosing a user ID and password. ​Sometimes, what happens is TD Ameritrade may not let you create a demo trading account because you may be registering from a “restricted country or region”. If this is the case, you can go ahead and use fake or made up information. Since this is just a demo trading account, using fake information does not violate any terms or conditions. After all, you’re only creating an account to practice so it isn’t a big deal. ​This site will create fake personal information for you. You can use this information to sign up for a demo trading account. ​Simply use the generated information to sign up for a demo trading account using the step above and you’re good to go. ​All set! Now you are good to go. ​After installing the software, simply log in to the Thinkorswim® trading platform with your registered account. ​You'll instantly have $200,000 “paper money” to practice trading stocks with, options and ETFs, as well as $10,000 for Forex trading. Use this account to practice until you get familiar with the stock market. Once you gain enough skills and knowledge, you can start trading with a real account. 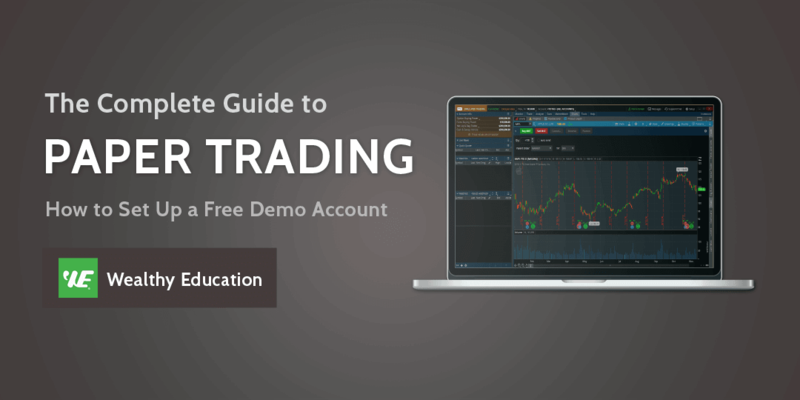 ​If you want to add more cash to your demo trading account, here’s how you do it. ​Next, you need to “Adjust Cash”. Go back to the Monitor Tab and you'll see the 100 shares we've just bought. It's better to practice with small accounts. When you trade with a lot of money, it's difficult to manage your profits and losses. You will not have a sense of what's going on with the market and you will not care much if you are losing your money (believe me, I’ve been there). Our main purpose of using paper money is to do real world investing with "free" money, which we shouldn’t lose sight of. You should start with a small account. Adjust the cash balance based on your actual financial capacity; for example, you plan to start investing with $10,000, so make sure you will use a $10,000 account to practice with. Try to grow that money - if you can turn $10,000 into $20k or even $100k, you are good to start trading with a real account. Practice until you can make a profit, until you understand exactly what you're doing, and until you are confident about the investment decision you made. The above should give you a fairly good idea so as to starting small and very gradually building up. ​To adjust the cash balance, you can also follow the guide above. ​As we’ve just seen, practice makes perfect. Even though you can really invest huge amounts of money and take big risks just to get a taste of how things work in the real stock market, I really would reiterate the importance of starting small, in order to get a gist of how things work. As long as you consistently practice, I promise that you’ll master the art of making sound real-life investment decisions through paper trading. The more you practice, the more you learn. Continue learning, and the more you’ll earn! You no longer need to sift through web page after web page trying to understand how to set up a paper trading account. All you need to know is right here in this guide. Congratulations, your investment journey has now begun! Good luck and keep at it. Now​ you have it - a detailed guide on how to practice trading stocks with paper money. Leave a comment below and let me know what your trading goal is and how much paper money you will start practicing with.